【MULTIFUNCTIONAL CREATIVE DESIGN】This ingenious clip string light can not only shine up your place with its warm and romantic warm white light in the dark but also you can share your beautiful photos by clamping on its clip for saving your place and making the white wall colorful. 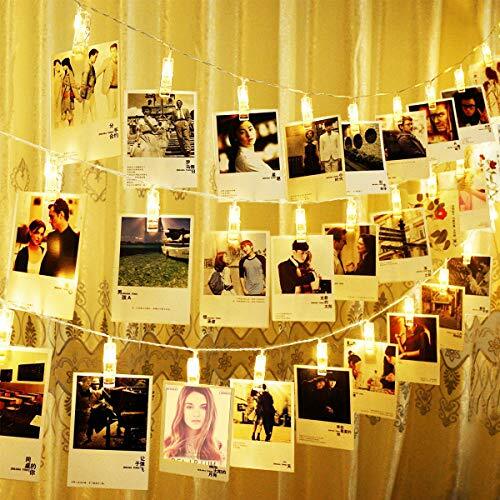 【COOL GIFTS/DECORATIONS】-- 20 LED string lights with photo hanging clips, 10 ft./3m total length and 5.2 inches/13 cm interval between clips, long enough for hanging pictures, cards, memos and artworks. Ideal gift for your family and home decorations. 【ADD ROMANTIC & FESTIVAL TOUCH】-- These cute led picture lights will produce a cozy warm white light that adds much festive and fun touch. Perfect hanging lights for bedroom, dorm, galleries, Christmas, Valentine's, Mother's and Father's Day and any parties, etc. 【EASY OPERATION】Just one toggle switch designed on the battery case，you can choose to turn on/off this string light by pushing this switch. 【LIFETIME WARRANTY, 100% SATISFACTION GUARANTEED】 We always stand behind our products. Should you have any issue with our string lights mounts, please feel free to get in touch with us. We will sort them out within 12 hours.